A 370 lit re composter, easy to install, manufacturer from weather resistant, maintenance free UV stabilized recycled plastic. 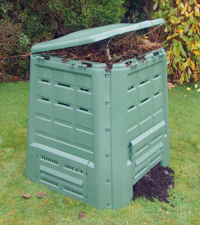 The front bottom panel is easily opened to remove ready compost. Complete with hinged lid. BUY TWO GA126 & SAVE £15.90!